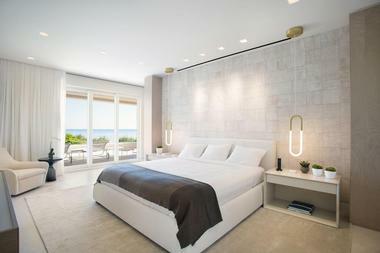 Situated on the beautiful Atlantic Ocean, Provident Luxury Suites Fisher Island features breathtaking sights, an 9-hole golf course, and a state-of-the-art spa. Provident Luxury Suites Fisher Island is ideal for family vacations, getaways with friends, or romantic trips. One-Bedroom Ocean View – With 690sf, this gorgeous room with a beautiful view can accommodate up to four guests. The suite includes a master bedroom with a king-sized bed, a living area, and a sleeper sofa. Guests can also enjoy a fully stocked kitchen, in-unit laundry facility, and private balcony. Two-Bedroom Ocean View – Able to accommodate up to eight guests, the Two-Bedroom Ocean View Suite offers 1380 square feet of space. The suite’s master bedroom includes a king-sized bed, while the second bedroom offers either two twin-sized beds or a single queen. This condo includes a living area and a sleeper sofa, a dining room, a fully stocked kitchen, and an in-unit laundry facility. The private balcony offers views of the ocean. Three-Bedroom Ocean View – The Three-Bedroom Ocean Front Suite has 1900 square feet of space. Between its three bedrooms, the suite can accommodate up to ten guests. The suite includes a king-sized bed, a queen-sized bed, two twin-sized beds, and a sleeper sofa. Guests can also enjoy a private balcony, in-unit laundry facility, and a fully stocked kitchen. Guests can visit Porto Cervo for Italian and Mediterranean meals alongside views of the ocean. Guests can enjoy their dinner in the dining room or out on the terrace. La Trattoria also highlights Italian cuisine. They offer pizza, pasta, and an expansive wine list. Guests of the resort can eat in the dining room, pick up their pizza, or even order delivery. Garwood Lounge & Piano Bar is the island’s luxury steakhouse. The restaurant features steaks, salads, and appetizers, served up in the celebrated Vanderbilt Mansion. For more fine dining options at the Vanderbilt Mansion guests can head to the City View & Library. For visitors of the resort’s golf course, Greenside is perfect for a casual meal and drinks after a day of recreation on the resort’s fairways. Greenside offers indoor and outdoor dining spaces. The Beach Club offers breakfast and lunch in an oceanfront setting, while the Beach Club’s Sunset Bar offers sushi and cocktails in the evening. For a day of rest and relaxation, guests can head to the Spa Internazionale on Fisher Island. Visitors can order a variety of signature massages, body treatments, and facials. Guests of the spa can also take advantage of the in-house fitness center. 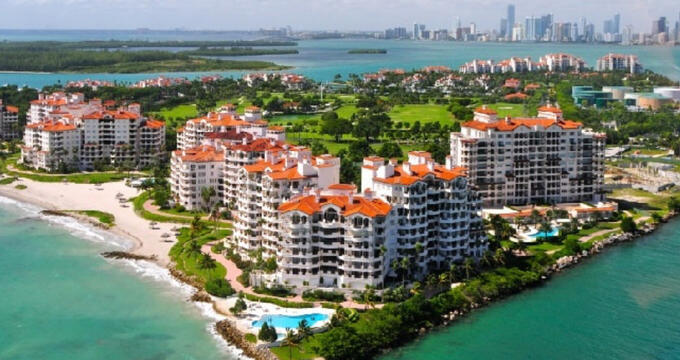 Guests of the Provident Luxury Suites Fisher Island can head to The Links at Fisher Island. This elite golf club offers scenic views, challenging terrain, and instruction by golf professionals. Visitors can spend the day on the greens, enjoy complimentary golf cart usage, and eat at the Greenside restaurant. The Links at Fisher Island also includes a Golf Shop, where golfers can purchase apparel and equipment. The Links offers a large clubhouse and a practice range, as well. Provident Luxury Suites Fisher Island does not offer traditional event spaces, but its large condominium-style dwellings make it ideal for reunions and other large events. Guests can also find event spaces at the Fisher Island Club, which partners with Provident Luxury Suites to provide recreational services to guests. Fisher Island and the surrounding area have much to offer guests of Provident Luxury Suites. For outdoor recreation, guests can visit the nearby Everglades National Park. Popular activities include hiking, canoeing, and wildlife viewing. The Miami Seaquarium is a favorite destination amongst tourists, where guests can observe sea animals and swim with dolphins. The island itself also offers a marina for boating and yachting, eighteen tennis courts, and a beach. In Miami, which is accessible by ferry or boat, guests can enjoy shopping, dining, and entertainment. Guests can visit a variety of malls, museums, theaters, and restaurants during their trip, such as the Bal Harbour Shops, or the Vizcaya Museum and Gardens. 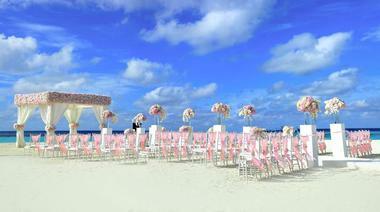 Miami is also notable for its thriving nightlife, offering a selection of bars and night clubs.